With road accidents happening left and right, it pays to be extra careful. Thoroughly check your RV for anything that can cause accidents before you next hit the road. Making sure it’s equipped with a fully-functioning tire pressure measuring system can make a big difference. They are built to let drivers know the current status of their tires. So if something’s wrong, they can immediately take action and get off the road. Having tire problems while traveling can get you in serious trouble. A TPMS can help you make sure your tires will safely and smoothly get your car going and that they’re strong enough to bring your car to a halt when you hit your brakes. TPMS are important to any vehicle, but especially to recreational vehicles that usually travel long distances. 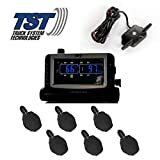 So if you have an RV, and you’re planning to go on a long vacation, make sure you have a great TPMS installed in your car. It can literally save your life. Here’s a guide on what to focus on when buying TPMS. We also included a list of our top picks of the best systems for RVs and what we do and do not like about them. What is a Tire Pressure Monitoring System and why do you need one for your RV? How can you use it while you’re traveling? What are the different types of Tire Pressure Monitoring Systems for RVs? Why bother getting a RV Tire Pressure Monitoring System? It can monitor more tires than the average TPMS – 26 tires! If you’re heavy on security, then this one’s for you. It has 6 sensors dedicated to preventing burglars from taking your RV. Safety is not an issue as long as you have this kit in your vehicle. The EEZ RV is a product of a leading manufacturer in the industry. They’ve been developing TPMS products since 2005. So it’s no wonder why this kit is superior to its competitors in a lot of things. It’s the end product of years of trial and errors. It can monitor a whopping number of 26 tires with a combined pressure of 210 PSI(Pound per square inch). A good TPMS can draw the line between life and death. Be very critical when buying one for your RV. Don’t be cheap about it. Focus solely on quality and features. Choose a TPMS that can let you sleep at night without worries. Get the best, most efficient one you can get your hands on. It doesn’t matter if it’s expensive. You’ll end up saving more in the long run. There are many features that make the EEZ RV a cut above the rest. It provides updated reports of your tires’ temperatures as well as pressure every 6 seconds. It’s extremely sensitive to any kinds of movements. If it fails to detect any motion within a quarter of an hour, it enters battery saving mode. 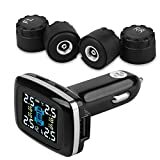 The device will also display an alert the moment your tire’s temperature and/or pressure reaches an unusual level, and just in case you miss that alert, it will also give out an audible alert. This system has a bigger screen than most TPMS. It is powered by a lithium-ion battery with a 60-hour lifespan. It’s also rechargeable so don’t worry about constantly replacing it. The EEZ RV’s sensors are extremely durable. Even under immense pressure, they would keep sending status reports to the display to alert drivers of their tires’ status. 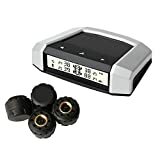 Although they don’t have rechargeable batteries like the actual TPMS so you have to constantly monitor them and pack extra batteries for them before hitting the road. Another great feature of this kit is that you have full control over your 26 sensors. They don’t have to be open 24/7. You can turn some of them off if you’re not using the vehicle they’re attached to. You’re almost never going to encounter any problem with this product. If you do, chill, their customer support is fantastic. They’re very helpful and knowledgeable about their product. It would also comfort you to know that this product has a 3-year long warranty. You’re guaranteed to get your money’s worth. The only real downside to the EEZ RV is its stressful installation. Just Flex your patience. You only need to do it once anyway. You can connect your phone to it regardless if it’s android or IOS. Powerful signal. You won’t need a repeater or booster. Can only monitor a couple of tires. This brand’s features truly lives up to its name. The TireMinder Smart is truly a very smart product. Regardless of what vehicle you drive, this system can monitor all of your tires’ conditions and give you real-time reports about them. Sadly, it can only monitor a maximum of 6 tires but it more than makes up for that with how efficiently it monitors them. You can connect it to your smartphone or any other android or IOS devices. The system sends a new report every 6 seconds to make sure you’re aware of all the little changes that might affect you and your RV while you’re traveling. Impressively, it can detect if your tires are too high or too low pressure. It can detect air leaks, even small ones, and alert you about them. The device can also send you reports about your tires’ temperatures-whether, they’re normal or too high that you’re in risk of blowing them out. To fully maximize the use of this product, download their app TireMinder. It displays all the information its sensors pick up from your tires. You can even view the status of every tire it monitors. Plus, it’s not that hard to set up. You can do it in 15 minutes max. The greatest thing about this kit is its powerful signal. Its built-in signal booster called Rhino makes it’s signal thrice more powerful than any other product the manufacturer has produced before. So if you’re into technology and bonus features, go for this one. It’s efficient and very modern. Perfect for people who can’t stay away from their phone. Since it can only monitor 6 tires max, you can’t use it for big or multiple vehicles. The monitor display is very user-friendly. Dead accurate readings of both temperature and pressure. Has an anti-theft feature to prevent burglars from stealing its sensors. If you want a very powerful TPMS in your car, check out Bellacorp’s product. It can send you the status of a maximum number of 34 tires. It reports real-time statuses of your tires and refreshes every few minutes. It’s a very versatile TPMS. You can use it to monitor multiple vehicles or even massive 18 wheeler trucks. It’s not as extremely high-quality as all the other products in this list but it’s efficient and it gets the job done. This TPMS can collect all the necessary information that you need to ensure your tires’ safety and efficiency. It can send you an alarm if your tires’ temperature becomes too high or if any of your tires’ has an unusual amount of pressure on it. It could also alert you if any of your tires are either under or over inflated even just by 1 PSI. This TPMS can give you the exact amount of pressure in each and every one of your tires as well as their current temperature. It can give you many other details about your vehicle that other TPMS doesn’t usually display, like the status of your airbags. This device has a security lock that safeguards your vehicle from thieves and helps prevent air leaks. Its large display monitor displays all the data collected from the sensors. Its sensors look like little bottle caps. Unlike other TPMS, you’re not limited to the number of sensors that came with the kit. You can buy more if you need them. The sensors don’t have rechargeable batteries so you have to regularly replace their batteries to keep them working. This TPMS is extremely durable and can withstand being submerged in knee-length waters. Of course, many features come with a price. This product cost a little more than most products on this list. It’s going to be worth it, though. Especially in the long run. Very customizable. If you’re very knowledgeable about cars, and you’d like to make changes in your TPMS, this one is for you. You don’t need a repeater. The signal it produces is powerful enough. The monitor is bigger than average. The units of measurement on the display monitor can be changed. Alarm instantly goes off the moment something in the tires’ values goes beyond or below normal. You can never go wrong with this the RV 6 TPMS. It has all the necessary features plus some little bonuses. It has great anti-theft features that prevent your sensors from being lost or stolen. And although they’re not rechargeable, this kit’s sensors are easy to replace, and it will only take you a couple of minutes tops. This kit a stronger signal compared to other TPMS. Don’t worry about its sensors being a little farther away from the main kit. This product has a movable monitor. It’s not meant to be installed in a single place. You can move it around wherever and whenever you want. So if you want to monitor your tires even outside your RV, just take your monitor with you. Plus, the monitor is huge. Don’t worry about missing any information with this TPMS. Unlike other kits, this one could only monitor six tires. Its monitor could be mounted to your car’s dashboard so you can easily see the status of your tires while driving. This TPMS will alert drivers when your tires pressure or temperature reaches an unusual level even just by 1 point. This kit’s sensors are flow through which means that there’s no need to take them out every time you need to blow air into your tires. The moment any of your tires reach an unusual pressure level, this kit will produce red light. Alert icons will also light up on your monitor and you’ll hear a warning sound coming from the main system. This system also delivers status reports in real time. If you’re very knowledgeable about cars and you don’t agree with the levels of when the TPMS will sound the alarm, you can actually adjust them. We don’t suggest it but it’s entirely up to you, of course. Like many feature-packed products on this list, this product’s downside is also its stressful installation. If you really like it that much, suffering through this step shouldn’t be that hard for you. If you like little details, you can program each and every sensor that comes with the kit. Sensors don’t need to be removed to inflate or deflate the tires. A little complicated. You’ll need time to get used to it. This kit is from a relatively well-known manufacturer. TST products regularly show up in top TPMS rankings so you’ve probably encountered their name before. This particular model is making waves among enthusiasts for its superior design and accurate status reports. It’s also capable of monitoring multiple vehicles. It’s currently a leading kit available right now. The TST 507 6 offers the same services that almost all of the products on this list can give, plus more. Aside from accurately reporting your tires’ temperature and pressure, it can assist drivers in preventing their tires from blowing out; A feature rarely found in a TPMS. This device has a colored display monitor, and it’s highly customizable. You can program every little detail to your heart’s desire, even the colors on the monitor. This product can display your tires’ temperatures instantly. It doesn’t have a couple of minutes delay like many TPMS and it can detect even the smallest air leaks. 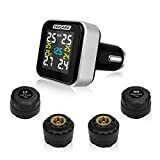 If you think you have superior knowledge about tires and you’d like to make changes on the TPMS, you can do it with this product. You can change the levels of high and low pressure to a maximum of four axles. This product comes with its own uniquely shaped wrenches that make it almost impossible to steal its sensors. So if you choose this one, you get more than the road security, you also get extra protection from tire thieves. This TPMS also has sensors that are flow through. There’s no need to take your sensors off to blow air in and out of your tires. Its batteries are also easily replaceable. Just be patient with it. This TPMS is not for everyone. The added features and customizable parts can be overwhelming for many people. It’s really a good TPMS but you need to let it grow on you. Real-time readings and instant alerts if either pressure or temperature is beyond normal. Has both displayed and audible alarms to make sure you don’t miss them. It has an antenna. Why? If you want a good TPMS that can get the job done, try the TireMinder A1A. There’s a reason why it appears on almost all top brand reviews on the internet. It’s a great and simple kit that delivers fast and accurate readings to drivers. It’s equipped with a decent-sized monitor where all of the data it gathers is displayed. Information on the screen is well placed that there’s no need to worry about getting confused when reading them. It’s a great device that will help keep you and your car away from potential accidents. Its interface is very user-friendly. It’s very intuitive and the manufacturer really had the users in mind when developing it. The display monitor is simple and clean. The information in it is well placed, and the icons are easily recognizable. There’s no need to stress yourself googling symbols to understand what’s on the screen. It’s designed to be easily understood even to people who don’t have advanced knowledge of cars. Plus, this kit has great control over all of your tires. If something goes wrong, you’ll know which exact tire has the problem and where you should start fixing it. This TPMS has a 4-minute interval per status reports. For some this might be too long considering other products in this list boasts being able to send new reports every 6 seconds. But don’t worry, many people have used this product, and they don’t seem to be bothered by the four-minute delay. It can monitor a maximum of 22 tires. It works with almost every type of vehicle. It also has both an audio and video alert that’s bound to get your attention in case something’s wrong. The system is designed to be self-aware. It will alert you of danger if any of your tires’ readings look like it will reach a dangerous level and not when it already has. It will also alert you when the temperature reaches 75 degrees Celsius. The biggest downside to this TPMS is the monitor’s antenna. It’s useful but not exactly aesthetically pleasing. A Small thing, though, compared to its countless benefits. 【Solar Power】: Tempered glass solar panels and 345mA built-in lithium batteries; Does not occupy the car cigarette lighter socket; Supports USB cable and solar charging. You need to get your own charging cable. Zeepin is a leading TPMS in the market today. Of course, it’s no surprise why. It’s packed with countless features that set it above the rest of the products on this list. It can definitely give the others on this list a run for their money. This product has a colored monitor display. Almost everything about it is customizable. You can switch between a Pounds per square inch or Bar units when viewing the current amount of pressure in your tires. This product monitors all of your tires simultaneously. It informs you of the changes that happen to each of them. This product can be charged by just the heat of the sun or through a power cable. So don’t worry about losing power while you’re traveling. This TPMS will send both a visual and audible alert once either your tires’ pressure and/or temperature go over or under the parameters it considers normal. It’s equipped with a strong wireless signal so don’t worry about monitoring your tires even from long distances. You’ll still be getting updated and accurate status report from all of your sensors. Like other TPMS kits, this one also has an interval between status reports but it’s only 4 seconds. You’ll still get an instant alert if something’s off in your tires. This kit is adjustable. You can adjust almost literally everything about it. Even the values of the pressure and the temperature at which the device’s alarm will start to go off. This kit doesn’t come with its own charging cable. A minor downside compared to its many features. You can just get one yourself. This is one kit you need to check out when shopping for TPMS. It’s equipped with a powerful system that refreshes every once in a while to give you accurate and real-time reports on your tires’ conditions. Unlike others, it can’t monitor all of your wheels simultaneously. It does, however, monitor four at once and then moves on to another four after that. This TPMS assigns an ID number to each of your tires. So you can monitor each of them easily. It has large monitor where you can clearly see all the information that you need while you’re traveling. There’s no delay on when new reports are sent from the sensors on the tires. They come real time so you’ll be notified immediately the second something’s off. The CACAGOO gives drivers a warning when something goes wrong. Even if your tires’ pressure goes down to even a PSI. You’ll know immediately. It’s common knowledge that underinflation causes great damage to your tires. This TPMS can alert you of that so you can fix it before it gets worst. It can detect air leaks, big or small. Unlike most display monitors, this one doesn’t need mounting. You can just plug it in the cigarette lighter on your car. All of the sensors are powerful and accurate. They can send you information even when they’re far away and even if your car is moving at a fast speed. They’re powered with batteries that last a decent amount of time and are easily replaceable. This product is equipped with a larger monitor than many others on this list. It’s normal pressure values can be adjusted to whatever value you want it to be; the same goes if for temperature. You’ll get real-time information and updated on your screen as soon as your sensors pick them up. This kit also has both an audible and displayed alarms. It’s waterproof and has a IPP67 rating. If any batteries on the sensor need replacing you’ll get a recognizable warning on your monitor screen. This system can’t boast a powerful signal like many other systems. It can’t be used on multiple vehicles. It’s best to just use it on a normal sized car and RVs. The signal is strong but not far-reaching. You’ll need a repeater for when your tires get too far away from your monitor. If you like fussing over small details about your RV, then you have to try B-Qtech’s TPMS. It’s wireless and extremely smart. It can help you monitor your tires simultaneously or individually. This product boasts fast and deadly accurate sensors. You’ll get the exact value of temperature and pressure on your tires down to the very last point. If it goes above or below normal, the alarms will let you know the second it happens. Don’t worry about constantly checking your tires, let this kit do that for you. If anything goes wrong, you’ll know. The product can handle a total of 215 pounds per square inch tire pressure. It displays all the information gathered in a large monitor that has a clean interface. The information on the display screen is well placed that it doesn’t look over-crowded. It’s very easy to understand. The sensors can still send signals to the monitor even from a distance. It’s not as powerful as other products on this list when it comes to signal strength but it doesn’t lag that far behind either. So expect accurate and on point reading even when you gain a little distance from your other sensors. This technology uses radio frequencies to alarm drivers if something’s wrong. It’s a great feature that sets it apart from the rest. Its sensors are IP5k4k and that’s why they’re excellent. If you’re into smart systems, then go for this one, it won’t let you down. Of course, if you’re driving a really long vehicle, say a 32 feet truck, you might need a repeater for it. We mentioned before that this kit doesn’t have the strongest signal so you’ll need a booster to still get readings from sensors that are really far away from the monitor. MUST-HAVE -- Must-have tool for drivers who drive an old car. Yokaro wireless TPMS can give you reading out clearly for tire pressure data, instead of giving the light on the dashboard. If you’re looking for more, then maybe the Yokaro Wireless is for you. To give it to you straight, it’s solar powered. That’s what makes it a cut above the rest. Don’t worry about recharging your kit or running out of power while you’re traveling. In terms of features and capability, this kit can give all the other TPMS a run for their money. It’s very compact and efficient. It gives all the necessary information instantly and with deadly accuracy. YOKARO’s wireless TPMS monitors four tires simultaneously. Even if any your tires go above the normal value, the system would keep sending status reports to the driver. Like many other TPMS kits, this one comes with sensors powered by replaceable batteries. It’s very durable and would most likely last a long time. It’s also weatherproof so don’t worry about taking it anywhere. You can also choose the units of measurement at which you want the data gathered from the sensors to be displayed. This TPMS has a large enough monitor and a clean interface. The information it displays is updated every few seconds. The YORAKO has strong and far-reaching wireless signals. You’re guaranteed to receive accurate and updated information from each of the sensors. Even if your sensors are hooked on another vehicle, you’ll still be able to accurately read their statuses. Should anything go above the normal value, the display monitor would immediately alert you. The YORAKO is also fairly easy to set up. Unlike many TPMS, you can finish it in a matter of minutes. YOKARO’s TPMS is superior to others in many ways. This product has a year-long warranty so don’t worry so much about getting your money’s worth. Speaking of money, you might get turned off when you hear how much it costs. It’ll be worth it, trust us. It a good investment. Real-time readings and instant alert if either pressure or temperature is beyond normal. In order to make the most out of your money, you’d want a TPMS that’s guaranteed to last a long time. Nothing beats TireMinder’s solar Powered Trailer TPMS when it comes to durability. It’s designed to last for years, and it could power through changing weathers and even being submerged underwater. It’s reliable and accurate. It delivers real-time status reports of each of your tires’ pressure as well as temperature. 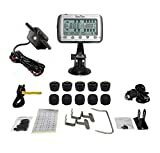 It has the power to monitor 4 tires simultaneously and a very noticeable alarm to alert drivers if any of their tires’ values go over or under the normal parameters it set. TireMinder’s solar-powered TPMS is very easy to set up. It doesn’t share the problem that many items on this list have. You can hook it up in seconds. You can charge it the way you charge your phone. It even comes with its own USB charger. The sensors on the tires are powered by CR1632 which has an average lifespan of two years. This kit is its manufacturer’s latest accomplishment. It doesn’t share many of its predecessors’ flaws. Its monitor is exceptionally huge and the readings it displays is updated real time. This product definitely deserves its place on this list. Your safety is guaranteed with this system in your car. This kit can deal with a maximum tire pressure of 70 pounds per square inch. That’s not a lot! 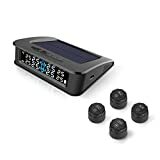 The VESAFE Universal Solar TPMS is a great kit to have on your car. Just like many on this list, it offers safety and protection to vehicles while they’re traveling. It can prevent your tires from blowing out or save you from driving around with underinflated tires which can damage them permanently or worst get you involved in accidents. The VESAFE can alert drivers of your tires’ status instantly. It cannot read all the tires simultaneously. It monitors them in batches of four. You can also check each and every tire’s information. This product has a colored monitor. It will immediately sound an alarm and flash a warning on your monitor once something goes wrong. It’s easy to set up. It’s a great feature that makes it more preferable than the other ones on this list. You don’t even have to go through the trouble of mounting it on the dashboard. Just plug it up your car’s cigarette lighter, and it’s done. If anything goes wrong with your tires, the kit will display a warning on the monitor as well as sound an alarm to make sure it got your attention. The best thing about this TPMS is its durability. It’s waterproof, and it can withstand extreme weather. It also has the anti-theft feature that many top TPMS kits have. The sensors’ batteries has long lifespan. It could last two years before needing replacements. If you did reach the maximum lifespan of their batteries, you can just purchase new ones. Just ask for CR1632 batteries. They’re available almost everywhere. This product also has 18 months of warranty in case you ever needed to use it. This TPMS is not for every type of vehicles. You can’t attach it to trailer and motorhomes but you can use it on RVs. We understand that you’re cautious, but it’s okay to let your guard down. We’re all just RVers here who want to share what we learned with our fellow enthusiasts. We really just want to save people from making the same mistakes that we made when we were starting out. This guide is the product of years of trial and errors so hopefully, it will serve as a shortcut for you. The products in this list are carefully chosen based on our experiences traveling. It’s a list of what we would choose if we were the one buying. We also took into consideration the factors that we discussed in our buying guide. This article is made by a group of well-traveled RVers. We talked about the ways on how we choose our RVs’ accessories, how we maintain them, and any specific products or manufacturers that we prefer to buy from. We compiled our answers and put together the list of the products that we think are best and why we think they’re good. We’re hoping that this guide can help you pick out the best kit for your RV. Read each product description carefully and get the kit that you think will work best with you and your RV. TPMS kits are monitoring systems designed to alert drivers of the overall status of their car’s tires. To use it, you have to install small sensors in your car’s tires, which will send status reports on a monitor where you can see them. These kits are designed to display an alarm if and when any of your wheels reach a dangerous level-either in its temperature or its pressure. Some smarter kits even have audible alerts to make sure that drivers are properly alerted. TPMS lets you know every change in your tires’ conditions that may affect you while you’re traveling. It’s little sensors on each of your wheels accurately report the amount of pressure, and the current temperatures of their tires are in. The kits also alert drivers of leaks in their card, even small ones. They send out alarms when any of the tire’s pressure or temperature reaches a dangerous level so the drivers could get off the road and do something about the problem. TPMS has been around for a while. It’s been developed by so many different companies that so many variations of it exist. It’s important to familiarize yourself with the types of TPMS you can get before buying one for your RV. TPMS is classified into two categories- the indirect and the direct. They are both wildly different and will give you different experiences while traveling. Direct systems are the more popular choice among RVers. It’s more accurate, especially in sending pressure reports to the driver. It alerts drivers the moment any of the wheel’s pressure went above or below the values it considers normal. Unlike many of the products on this list, direct TPMS puts a tube sensor inside your tire instead of just sticking a cap on it. This allows you the extra ability to adjust your tires’ pressure to whatever value you want it to be. Indirect systems are not known for their accuracy. This is the main reason why they lost to their direct counterparts. This system uses your vehicle’s performance to guess the status of your tires. It doesn’t actually have a sensor on them. It could only tell you if something’s not right and what’s going on with your tires but not how bad or good things are going. Both direct and indirect systems can increase your safety traveling. Although, it’s obvious to see why direct systems win over the indirect ones. Sure, the later is cheaper but this is your safety at stake and no amount of money can buy that. It’s best to go with accurate and smart direct systems. Plus, direct systems comes with ABS(Anti-Lock Braking System) and most indirect ones don’t. No matter how good of a driver you are, you’re never really 100% safe from road accidents. While we can’t stop accidents from happening, we can at least take precautions to minimize their chances of happening to us. A really TPMS can save your life. It’s what the kits are designed for-to alert dangers if any of their tires are in a bad condition. That’s why it’s important to find the one that works for you and can really deliver fast and dead accurate information so you can fix the problem and get off the road before you get into an accident. It’s well known that though underinflated tires can still get you to where you want to go, they can be seriously damaged, and their lifespan will be slashed by almost half. Having a great TPMS on your car can alert you of over and under inflated tires so you can immediately do something about them. A TPMS can sense if there’s something wrong with your tires. With it, problems can be fixed before they get worst. It will help you maximize your MPG. Underinflated tires burn more gas when you’re traveling. With normally working tires, you get to save fuel and money. A TPMS can get your job done for you. The system is reliable and accurate. Trust in its numbers and the data that it gives you. The device automatically checks on the pressure as well as the temperature in your tires. Don’t bother checking if it’s working or not. The sensors never stop sending data to your monitor. The device doesn’t have a knob or switch. It will keep doing its job until batteries run out or it’s uninstalled from the vehicle. TPMS also ups your car’s value. With it, the car’s value increases. The safety that the device can bring is valuable, and insurance companies know it too. Before picking a favorite and running to the store to buy it, think very clearly if it works with your vehicle. Don’t focus on the impressive features, take these points into account and decide on which product would work best for you. No matter what information the sensors pick up from your tires, you won’t be able to use it if you can’t see it clearly. This is why your TPMS’ monitor matters. Choose one that’s large enough to display all the data you need and that doesn’t abbreviate or cut terms too much to fit everything on the screen. Its icons should be easily recognizable and understandable. Take the monitor’s design into consideration. Is it readable and from how far? Are there any alert lights that can be easily seen? Can you read the information displayed even at night? All these things will matter once you’re traveling so while you’re shopping for your TPMS its best to ask them early. RVs go everywhere. They’re made for long distance traveling and are usually subjected to different kinds of weather. When choosing a TPMS, take the strength of the material into consideration. The last thing you need is to have to buy another one so soon. Find out how the product will react to being submerged underwater or being soaked under the sun for too long. Research on what materials they’re made of. If you’re lucky, someone somewhere already bought and experienced that TPMS and you can just base on their experience to decide whether your choice is good or not. After figuring out what type of TPMS you want for your RV, the next thing you should fuss about is the battery. TPMS comes with many different battery requirements. Some offer solar charging while others stick to the old cable and socket. Whichever you choose to go with, the battery will greatly affect your overall experience with your TPMS. Check if your system’s batteries are durable. Make sure they can keep up with different weather and temperature changes. Always consider the battery’s lifespan. You don’t want to lose power in the middle of the road. If you can, chose a TPMS with a reusable battery. They’re everywhere these days so you won’t have a hard time choosing one for yourself. Some TPMS also offers solar-powered charging. It’ll cost you a little bit more, but it’ll be worth it in the long run. Did you notice that many products on this list have installation as their bad downside? If you’re not a crafty person and you’re not into DIYs you might need to pay a little more attention to how these kits are assembled and installed. It won’t be easy, but it shouldn’t be hard enough that you’ll need a technician just to get it working on your car. There are many pressure monitoring systems around. If you really think that a product would eat up your time and your energy just with its installation just skip it and find the next good one. Read product descriptions and review carefully. The TPMS kit should come at least already assembled and ready to be plugged to your car. You shouldn’t have to put it together yourself. Gravitate towards products that don’t have a complicated installation process. You might end up wasting your money if you damaged or destroyed it. That’s just about everything that you need to watch out for when buying TPMS. Of course, over time, you’ll also add more factors to this list when buying TPMS. Don’t get easily swayed by cheap products. Focus on the usability, features, and peace of mind that a great TPMS will give you while you’re traveling. How important are Tire Pressure Monitoring Systems to vehicles? The answer is very. So much that its become a must in the US for every vehicle to have them. There are certain rules and factors that dictate what kind of TPMS are allowed for certain vehicles. Be sure to read up on that so you don’t encounter problems in the future. What are the difference between sensors that are flow through and those that are anti-theft? Actually anti-theft and flow through are two different features. Anti-theft secures your tires to prevent burglars from taking them and flow through allows you to re-inflate or deflate your tires without needing to take the sensors off. You don’t really have to choose between them. Many kits have sensors that are both anti-theft and flow through, especially the top ones. Who are the reigning TPMS manufacturers today? The products on this list all come from reputable brands. The CACAGOO, the Bellacorp, the EEZTire, and the TireMinder are all great brands that offer high-quality products. If you’re really curious, try reading reviews about them online to find out more. How much money should I set aside for a good TPMS? We can’t really say. Price varies depending on how feature-packed your choice of TPMS is. The list that we compiled has products with varying prices. Best choose a product and then check out their price, at least get a concrete idea how much your money’s worth in terms of TPMS quality. How reliable are those temperature and pressure readings? Very accurate. Even the products that are wireless give dead accurate readings, real time. Remember that TPMS has been around for a very long time. Many companies have run off and experimented on technology over the years. The ones we have available today are end product of years of efforts. They’re very accurate down to the very last digits. You can trust the data that they’ll provide you. How do I know that my sensors’ batteries need replacing? We’ve mentioned a lot that sensors’ batteries need constant replacing. There’s really no certain time when the batteries would run out of power. It really depends on what battery is inside the sensor that you chose. Once you find out what battery brand and model is in your sensor, google its average lifespan and replace it at least two weeks before that, just to be sure. Ok, I have my TPMS. How do I get it in my car? Your chosen product should come with its own installation manual. Just follow it carefully. If you’re at lost or unsure, try youtube. There are many enthusiasts that discuss how some TPMS are installed step by step. Sometimes, they even have demonstrations that you can follow in setting up your own. 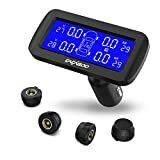 How do I use the data that my TPMS provides? If you’re entirely new on using this device, it’s going to take some getting used to. There should be a guide that comes with your product explaining what each icon is for and what the values on the monitor display area. Pay attention to the guide. Don’t just read it once, take it everywhere until you’re familiar enough with your device. Just be very critical when buying TPMS. Use our guide to find one that suits you and your RV. Take the factors into consideration before buying one. Don’t just pick the product that seemed more impressive. Compare and contrast products in terms of accuracy, speed, and affordability. You should also include the installation when deciding whether to get it or not.